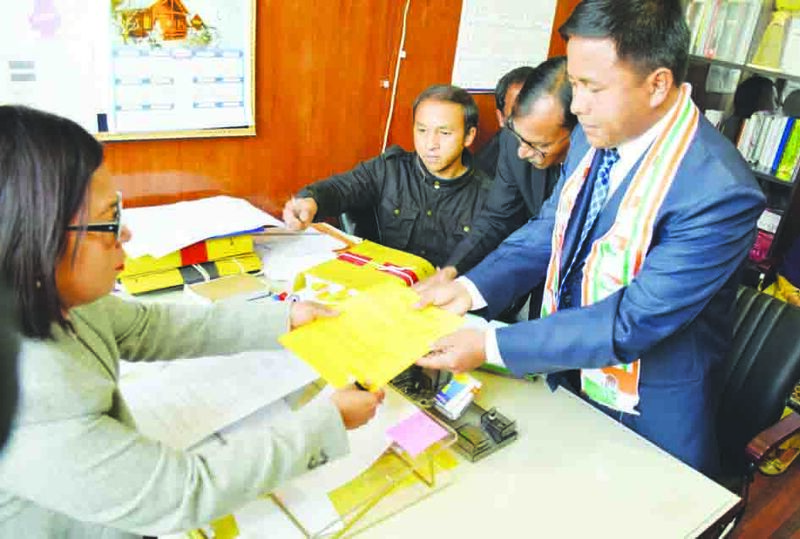 SHILLONG/Nongpoh/ Nongstoin/Mawkyrwat: Altogether 112 candidates, with 56 each for elections to the Khasi Hills Autonomous District Council (KHADC) and the Jaintia Hills Autonomous District Council (JHADC) polls, filed their nominations on Wednesday. Some of the prominent names are Moonlight Pariat (UDP), Robinus Syngkon (NPP), Madonbai Rymbai (NPP), Violet Lyngdoh (NPP), Equator L Nongrang (UDP), Goodleaderson Nongsiej (HSPDP), KP Pangniang (HSPDP), Titos Chyne (UDP), Teinwell Dkhar (UDP), Martle Mukhim (HSPDP), Ronnie Lyngdoh and Auguster Jyrwa (Congress), Thomas Passah (KHNAM) and MLA Lambor Malniang. In Nongpoh, former chief executive member of the KHADC and five time MDC, Rangkynsai Makdoh, filed his nomination from NPP. People’s Democratic Front (PDF) candidates who also filed their nomination papers at the office of the Ri Bhoi deputy commissioner include Macdalyne Sawkmie Mawlong from Umsning, Witness Syngkli from Jirang, Joseph Makdoh from Mawhati and Patbun Syngkli from Nongpoh. Till Wednesday, the number of candidates who have filed their nomination papers from all five constituencies of Ri Bhoi have risen to 20, including three candidates who have filed their nominations on February 4. Nine candidates filed their nomination papers before in Nongstoin, Ram-brai, Mawthadraishan and Mairang on Wednesday. LG Nongsiej from HSPDP and Apsharailang Syiem from NPP filed their papers while HSPDP candidate Badariti Lyngdoh Nonglait filed from Mawshynrut. In Rambrai, NPP’s World Champion Paliar and HSPDP’s K P Pangniang filed their nominations. Speaking to reporters, Apsharailang sounded confident of winning. He said the district council branch in Nongstoin has been neglected and stressed the need for preserving the rights of the Khasi people. Meanwhile, four candidates in Mawthadraishan constituency candidates who file the nomination are Blandingstar Warjri from Congress and Damian L Marshiangbai from HSPDP and in Mairang constituency Batskhem Ryntathiang from Congress and Equator L Nongrang from UDP. In Mawkyrwat, the ruling partners of the MDA government – the UDP and NPP on Wednesday expressed confident of winning the Langrin seat in South West Khasi Hills District in the council polls. Speaking to reporters after filing of nomination papers at Mawkyrwat, NPP candidate from Langrin, Kitborlang Nongrem said that the party has prepared well and had organised almost all the primary units in the constituency. “In Langrin, it is very clear that the UDP will win with a bigger margin because of the joining of leaders and supporters of other political parties”, said the President of UDP South West Khasi Hills District, GG Bung Snaitang. Others who filed their nomination include UDP candidate from Mawkyrwat Constituency, Anvil Lyngdoh and Congress candidate from Mawkyrwat Constituency, Carness Sohshang.